Most of our satellites orbit the Earth – either in Low Earth Orbit, LEO, Medium Earth Orbit, or in Geostationary Orbit, GEO. The closer to the Earth a satellite is the shorter its period. So – What if the satellite is even further away than the geostationary satellites? Why would you place satellites that far from the Earth? There are satellites that aren’t orbiting the Earth, not exactly the Sun either. They are rotating with the system in points called Lagrangian points, after the Italian/French mathematician, Joseph-Louis Lagrange, 1736-1813. Where ever you find two bodies in space, where a smaller body is orbiting the larger one, you’ll find these five points. You find them in the Earth-Moon-system as well as in the Sun-Earth-system. Here we’ll concentrate on the Sun-Earth-system. Lagrangian points 1-3 are “saddle-points”. L4 and L5 are stable if the mass ratio between the two large masses exceeds 24.96. 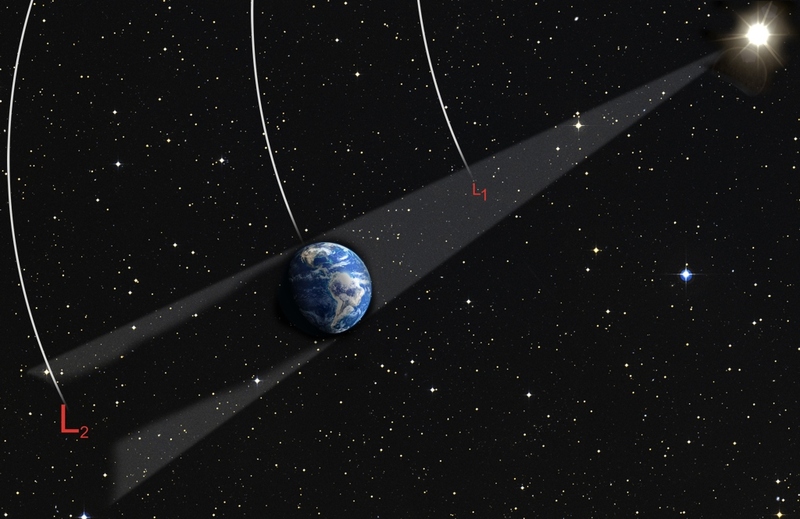 Lagrangian points 1 – 3 lies in a straight line with the Sun and the Earth. L1 is between the Earth and the Sun. If you do the math you’ll find that the point where the Sun’s gravitation equals the Earth’s would be just over a quarter of a million kilometers from the Earth’s center. That if the system wasn’t rotating. But now it is. The Earth’s orbital speed is about 29800km/s which means we have to calculate with a certain inertia. In L1, if the satellites would keep the same orbital speed as the Earth, they would normally start a spiral formed journey to the Sun. Speeding up would mean that the inertia kept the satellites in steady orbit, but they would, of course, leave the Earth behind. 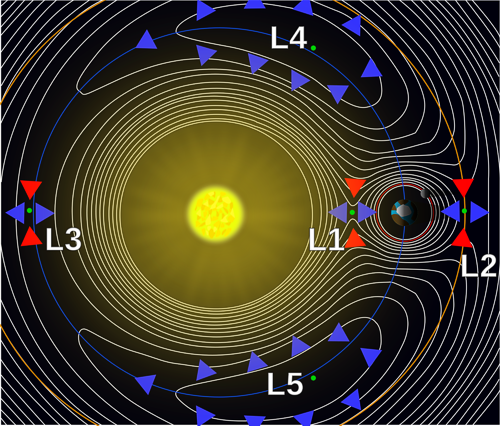 Though including the Earths gravity to the equation L1 becomes quite stable at its distance about 1/100 of the Sun-Earth distance away from the Earth. In L2, on the far side of the Earth, seen from the Sun, without the gravity of both the Sun and the Earth satellites would have a lower orbital speed and would be left behind. See animations here. L3 is difficult to use due to the difficulties in communicating with satellites on the other side of the Sun. L4 and L5 would be excellent due to their stability. Place a satellite there and it would be like placing a cueball in a bath tube. It wouldn’t leave. Unfortunately, the same thing goes for dust, and small rocks in space. Satellites wouldn’t stay clean, nor safe. 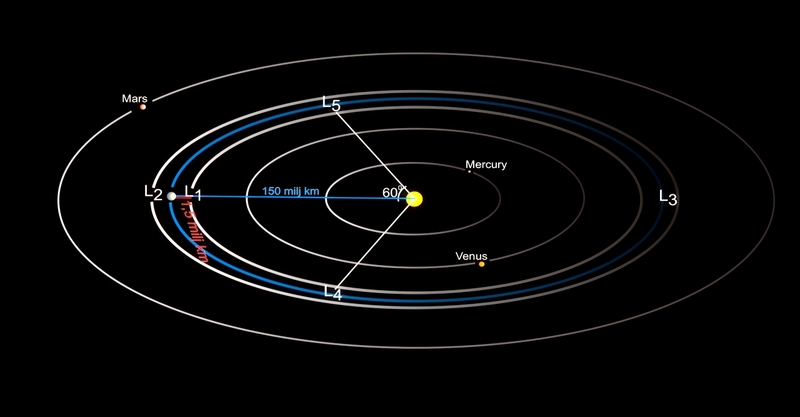 Lagrangian points four and five in the Sun-Jupiter-system exemplifies the problem. 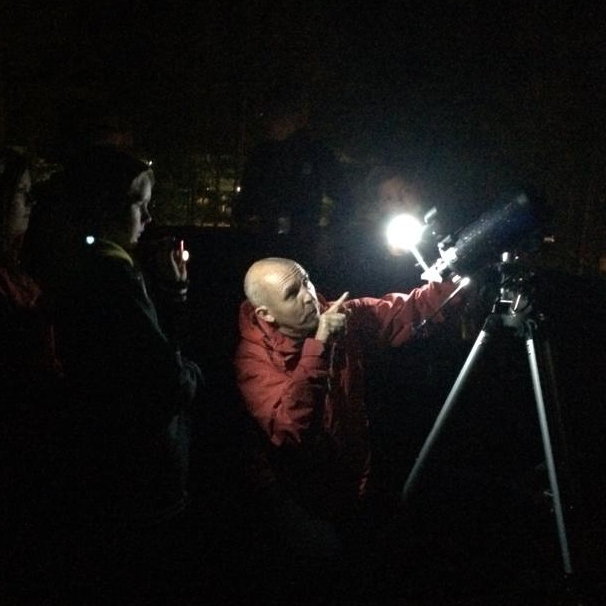 L1 is an excellent place when it comes to monitoring the Sun and the solar wind. SOHO, Solar and Heliospheric Observatory, ACE, Advanced Composition Explorer, and DISCOVR, Deep Space Climate Observatory, are satellites orbiting L1. Far from the Eart’s heat radiation, and at the night side of the planet, L2 is a good home to satellites looking out into deep space. Here you find Herschel, Planck, and GAIA. The Lagrangian points are still more than viewpoints. December 3d, 2015 the LISA Pathfinder is been launched from Europe’s spaceport in Kourou to reach L1 in late January 2016. It’s delicate mission is to test the technology for measuring gravitational waves. L1 is a balanced choice.